I really like the designs and art work from MTMTE, and there are some figures out there that are straight out IDW MTMTE comic book, but are we going to get more figures from the MTMTE comic? like Drift, Rodimus, Ratchet, Tailgate, Cyclonus, etc..? From Hasbro? Wait and see I suppose. It's a little unclear when they'd continue the Generations line again. Some are already done in the eyes of Hasbro, like the recent Generations Legends Tailgate, and some of the older Generations/Classics figures Like Drift and Cyclonus. Other than that, it's 3P filling in some of the holes or providing more comic accurate products (e.g. MakeToys Rear-End). Well, we've already got Tailgate. I'd love a Cyclonus, but I don't know how likely it is after they just did the boring CW one. The IDW figs are some of my favourite designs, though; Skids and stealth bomber Megs are awesome. I hope they keep making more. Top 3 on my wish list would be Tarn, Earth mode Arcee, and a proper all-out leader class Nova Prime (hey, I can dream). I doubt Hasbro would make anything from the DJD - it's too niche. They'd stick with the mailine characters for wider appeal. In the meantime, the DJD figures coming from MMC look great. I've made the same Rodimus Bob linked to there, and I'm gonna be making a second one for my best friend. 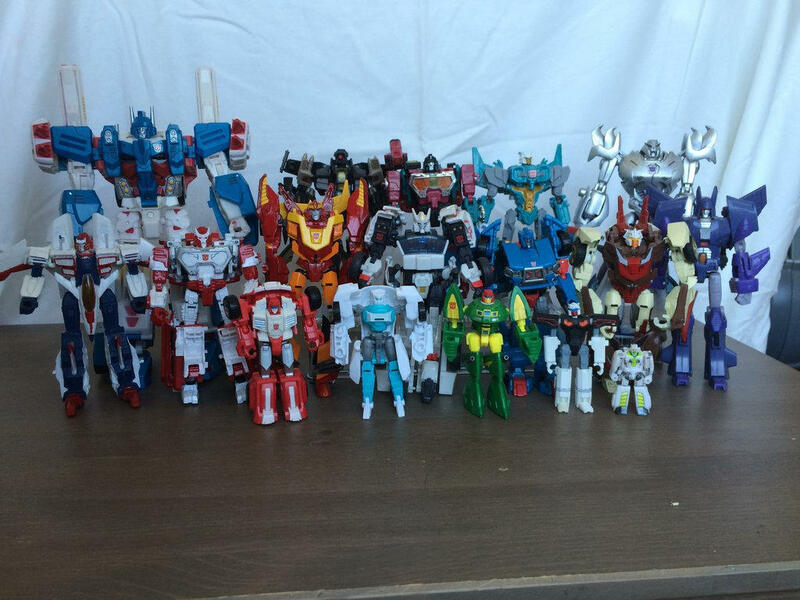 Almost the entirety of my Lost Light crew are repaints though. Seven of them in that photo are complete repaints. Nice display! Haha, Pharma wasn't on the crew, was he? Cool custom, though! Looking over all of those, Magnus, Skids and Swerve are definitely the most perfect MTMTE representations Hasbro has given us so far. Where's the Rewind from, out of curiosity? PS. Prime Megs looks like he got lost, haha. I highly recommend the CW leader; he's pretty awesome and might fit in a little better. Tailgate, Skids, and Crosscut are pretty bad figures. If you can get them for $10 then sure, then they are worth it. Haha, Pharma wasn't on the crew, was he? No but he was introduced via the MTMTE comics, so he doesn't fit in anywhere else. Where's the Rewind from, out of curiosity? Tailgate, Skids, and Crosscut are pretty bad figures. Say what?? I can't vouch for Tailgate, but Skids is awesome! As a representation of his IDW appearance, I'm not sure how he could be any better, right down to all his hidden cannons and missiles! Amazing how much they managed to fit into a deluxe pricepoint. Not to mention his spot-on headsculpt. Cool! Yeah, I do wish CW Megs weren't so simplified, but he's a really clever and effective design despite the simplifications. His tank mode is fantastic (love the working turret and treads) and the bot mode is probably the best G1-style Megs we've ever gotten, despite his somewhat wonky legs. He's not perfect, bit he's pretty darn good. But to each their own, of course!